Ontario peaches are ripe and ready. Of course, that means summer is almost over, but what a way to go out! I wanted to use peaches in the main dish tonight since they always seems to be relegated to dessert (not that I am complaining). If you dislike tempeh you could use tofu instead, or just stick with the beans. As it stands, this dish is a protein-fest so you could tone it down a bit. 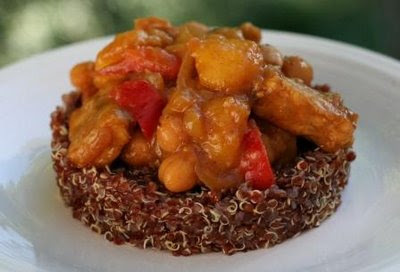 Also featured here: red quinoa! I saw it at the bulk food store and snapped it up. The only difference seems to be the colour, but perhaps there are secret health benefits too. I think green onions would have been good in this dish, but I was out. 1. Place peaches, ginger, water, and sugar in a blender and process until very smooth. Heat 1/2 of the mixture in a non-stick frying pan over med-hi heat and bring to bubbling. Add tempeh and cook, stirring frequently, until sauce has been absorbed/has cooked down. Reduce heat and cook until tempeh becomes golden brown, stirring frequently. Remove from pan. 2. Wipe pan down and return to heat. Add oil and saute onion and pepper for 5-7 mins, until translucent. Add remaining peach mixture and return tempeh to the pan. Add chickpeas, hoisin sauce, and water and bring to bubbling. Reduce heat and simmer for 10 mins, adding more water if sauce gets too thick. 3. Stir in onions and remove from heat. Serve over quinoa or rice.